As a child, I remember dressing up in my mom's clothes and high heels and pretending I was a grown-up. I'd sit at my desk and "work," then drive home on my sofa car to make dinner in my play kitchen. 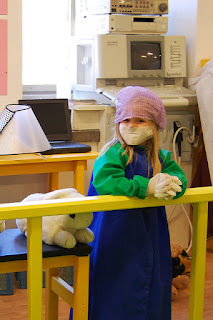 Those moments of imaginative play kept me busy and sparked my creativity. Now that I have kids of my own, I do all I can to encourage them to play because their creativity and imagination can help them grow and thrive in many ways. The other day, my girls pretended they were on a safari to Africa. They used an old box as a Jeep, drew zebras and giraffes on poster board, and even took turns pretending that they were the animals. Their activities that day reminded me that play does connect our kids to our world and teaches them about diversity. Through make-believe, singing, acting, and crafts, our kids learn about different continents, cultures, and people, and they become more empathetic and understanding. Maybe my girls will never travel in real life to Africa, but they sure did make the continent come to life in our living room last week. Interactive songs with motions were some of the first imaginary games I played with my girls. They loved rolling their arms like the wheels on the bus, and we made dozens of patty-cakes every day. These creative games and other fun play activities laid the foundation for improved communication skills. Not only did my girls learn to talk as we played, but they also learned to express their thoughts, emotions, needs, and wants. Even today, they continue to learn to use their words in a variety of situations as they develop their communication skills. Kids aren't born with the ability to identify, discuss, or regulate their emotions. I use creative and imaginary play to help my girls learn more about their emotions and to learn how to express them properly. For example, we used dolls, especially when my girls were younger, to talk about feelings and learn to empathize with others. And I've found that bracelet-making, drawing, and building defuses anxiety and stress. Whether they're happy, sad, excited, shocked, or angry, kids can use creative and imaginary play to learn, express, and manage their emotions in a healthy way. It can be challenging for kids to navigate social situations. Play has helped my girls learn to meet new people, build friendships, and handle conflict. As they choose a game they both enjoy, they learn to negotiate, and make-believe play allows them to act out social scenes. My girls have expanded their social skills and their social circle as they play. During imaginative play, my girls get creative with common objects around the house. Towels become superhero capes, stuffed animals act as hospital patients, and cardboard tubes turn into binoculars. For extra fun, I keep a prop box and change the contents every few weeks to keep my girls' imaginations active as they play. I appreciate watching my kids repurpose common objects. This ability helps them think creatively and problem-solve, a valuable life skill, and it reduces waste and protects the earth. When my girls were toddlers, I bought them a huge box of building blocks. They had fun building castles, roads, and rockets, and they learned to solve problems as they maneuvered the blocks to stack them on top of each other. Problem-solving is an important skill for kids to develop, and they learn this skill as they put puzzles together, create clay objects, and act out scenarios where the princess escapes from the dragon and lives happily ever after. The problem-solving skills they learn now will help them succeed in all areas of life. I realized when my girls were babies that my main focus as a mom was to teach my kids independence that would help them thrive as adults. I'm grateful that imaginative and creative play teaches them this skill. Give your kids control over the books they read, stories they make up, and fantasy worlds they create. This autonomy during play equips them to be independent later in life and prepares them for future success. Our kids thrive in seven areas when they play and use their imagination. How will you encourage your kids to play and thrive today?